Kezia grew up in Punjab in North-western India. She completed her Bachelors of Science, Chemistry (2015) from University of Madras, Chennai with a research project on opto-electronic properties of transition metal chalcogenide nanoparticles. She worked with Prof T Pradeep at Indian Institute of Technology Madras on fabrication of metallic nanostructures using ambient droplet sprays, funded by the Indian National Academy of Science (2016). 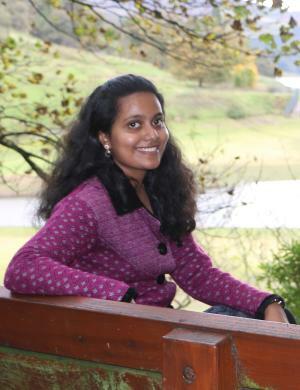 She obtained her Masters from the Department of Chemistry, Christ University, Bangalore (2017) as a University Grants Scholar and her dissertation was on nanostructured fluorescent probes for heavy metal detection in contaminated water. After spending the summer working with Arcler Press Ltd on the editorial team of a graduate level textbook, she began a PhD in October 2017 under the supervision of Dr Jona Foster, Dr Ahmed Iraqi and Prof David Lidzey with a University of Sheffield faculty of science doctoral academy scholarship. Her PhD focuses on exploring 2-D metal-organic nanosheets as new generation photoactive materials in organic bulk heterojunctions. During her free time, Kezia enjoys reading, cooking, singing (with the university gospel choir) and travelling.